Most of us aren’t strong enough to resist the temptation of playing with a clicky-top or twisty-end pen. The designers at Beyond Object exploit that weakness in the best way possible with their Align pen. The pen has three sections: a longer bottom section and two smaller pieces near the top. The middle section pivots to release and retract the ball point. When it’s not in use, the top and bottom sections are aligned and the middle is offset. Twisting the middle section puts it in line with the bottom while keeping the top section offset and releasing the ball point writing tool. Far removed from the familiar disposable pen, the Align is more like a tiny functional sculpture. 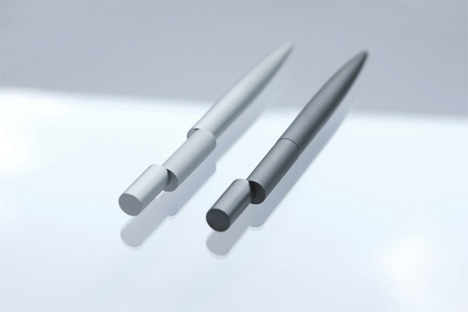 The Align pen was built to be entirely intuitive to operate. It feels like using a high-end luxury item, but the price is far below that of other luxury pens. 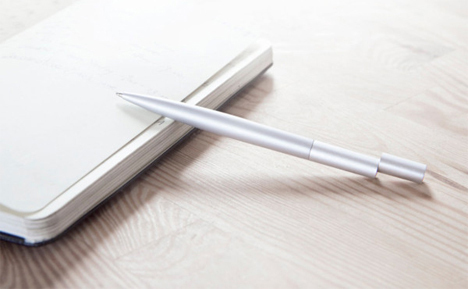 Although it’s not yet available on Beyond Objects’ online shop, during their Kickstarter campaign the refillable pens sold for £40-£50 (around $67 to $83). See more in Home & Personal or under Gadgets. October, 2014.